This ever so delicate wooden frame features a lovely leaf design. The frame is supported by an elaborate easel piece which is just as beautifully cut. You can paint or stain this piece. 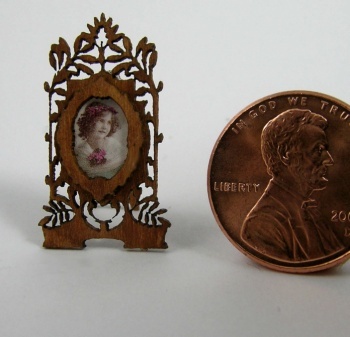 Included in the kit are all laser cut wooden pieces, trim to attach easel back, and several antique photos which have been sized perfectly to fit this frame.